The Dips exercise focuses on using your own body weight, or a machine if you need the assistance, to work your entire upper body. The dips exercise is a great way to finish your chest routine. If you’re doing shoulders on chest day, it’s also a good transition into your shoulder routine. Begin fully extended on the bars, and lower yourself carefully. Try not to put too much strain on your neck, look forward while you perform the exercise. Start by hovering above the bars, and then move down slowly until you feel a slight stretch in the chest. If your not getting the full range of motion, look for assistance by using a machine or elastic bands. Once you feel the stretch in your chest, move back to the starting position as you breathe out. 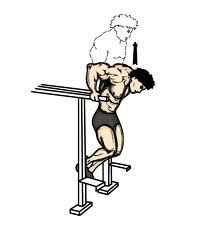 If you don’t have access to parallel bars, try using chairs from around your home or office as in the YouTube video below. If you want to increase resistance during the dips exercise, you can add weight via a weight belt, backpack, or by holding a dumbbell with your legs. The Joe Manganiello Workout uses dips for his “True Blood” Werewolf workout. He adds leg raises, which allow him to work his core. Working two different body parts at a time is central to Joe Manganiello’s workout. 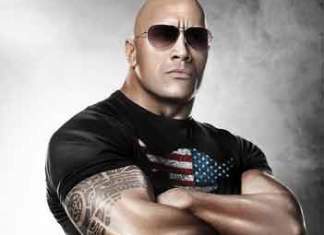 The Rock Workout for Pain & Gain and The Rock Workout for Hercules both use dips with reps to failure. This makes sure you’ve worked your chest and triceps to the core. The Jay-Z workout and Beyonce workout both use the Reverse Dips exercise with celebrity trainer Marco Borges. The Chris Evans workout for Captain America uses weighted dips. He attaches weights to his body during his cardio circuits. Anything involving your own bodyweight is tough. Start slowly and just go halfway down. As you gain confidence, allow your chest to get lower, until your elbows reach 90 degrees, which is a full repetition. Reverse Dips just means you’re doing the dips exercise with your arms turned around, behind you. What’s great about reverse dips is that you can literally do them anywhere. Not only could you use a bench, but also a table, chair, or other stable, elevated object. Lock your knees and lower your body toward the ground until your elbows are bent. Then, go up until your arms are parallel to the ground. For an extra boost, keep one leg in the air throughout the exercise, changing legs each rep.
Know anyone who can benefit from the Dips Exercise exercise?